It’s time for a film based on a controversial case in Germany. Essentially there was a girl who was having visions and started acting crazy. Some believed she was possessed by a demon while others believed that she had psychosis and needed medication. She decided to go with the exorcism strategy instead, but it failed and so she ended up dying. The film focused on the court case which followed this while relying on flashbacks to fill in the gaps of the past. It’s definitely not my kind of movie. Well, to address the case, I’m going to assume that she was simply very sick and not possessed. The topic of possession is always very complicated. I’m personally of the opinion that Christians cannot get possessed. At least not in the current age. It’s possible in the past that a Christian could get possessed as a test of faith or a way to illustrate God’s power to others. A child was possessed in the old testament after all, but there are two reasonings for it that wouldn’t necessarily go against my theory. One is that as she was a child, she had not yet become a born again Christian. As such she did not have any protection yet. Of course, even if she died while being possessed that wouldn’t doom her to Hell as another belief I have is that if you have not yet been given a chance to become a Christian before your death, then you still may if you would have become one. Since God knows the future, it’s conceivable (And probable) that he takes this into account. After all, it wouldn’t be very fair if you died in a bombing when you were 3 years old and must now go to Hell. It’s an exception depending on how you look at it or just simply a case of God knowing where you should be going and sending you there. The other way the child could have been possessed is simply because Jesus had not yet died and so we weren’t given the Holy Spirit. I believe that our protection is a lot stronger now since through Jesus death on the cross we all received the Holy Spirit. Before that, times were certainly tougher even though you shouldn’t worry about the tribulations since it will all be worth it in the long run. The girl was stated to be a devout Christian who was a Catholic. In this case that means she still believed in the death and resurrection of Jesus, but also believes the Pope and the Church to have greater power than the average person and can be a way to salvation. That gets a little murky since Jesus is the one and only way to Christ, but I’m not here to debate Catholic vs Christian beliefs and haven’t studied up on it enough to ensure I wouldn’t make mistakes. I’ll just say that all of this gives me plenty of reason to doubt that she was possessed. I personally think she was just suffering from psychosis and had a lot of bad hallucinations that caused her to believe this. The mind is pretty powerful so hallucinations can absolutely seem real to the individual who is being affected by them. It’s definitely a sad story and a pretty awful way to go. I suppose the film does a good job of showing how bad the whole situation is. Naturally the flashbacks go for the “demon is real” route since if it went too ambiguous it wouldn’t be much of a movie and this can also make the scenes more intense. The dream of sacrificing yourself to help others see the light doesn’t really seem like something the Virgin Mary would say. I also don’t remember her becoming an angel…..but it made for an intriguing scene. I believe that self sacrifice and suffering is a big part of the Catholic religion but hopefully that doesn’t fall into the being saved by works as opposed to repentance but again I’m starting to digress. Lets move on from that. Back to the film. The court scenes are handled pretty well with the lawyers getting sarcastic and the Judge being fed up with both of them. It leads to a lot of back and forth even if some of the witnesses do seem kind of eccentric themselves. I just like court room scenes and whether the witnesses bring up valid points or not, I just like the atmosphere. If the whole film had been the court scenes then I would have enjoyed it quite a bit more. Overall, This film is based on a real event enough so that I won’t give it an actual score. If you want to learn more about the case I’d recommend watching a documentary or following along through online. After all, if you watch the film you’re simply getting a very dramatized enactment of the story where you can’t trust the facts quite as much. I suppose the theatrical visuals will make it more entertaining but if you really want to learn about the topic, odds are that you’ll want to go straight to the source. 90% of the time that’s the best way to go about it. It’s not a super violent film or anything, but it does go into detail and again, it is trying for shock value and gritty realism so bear that in mind. As for me, I’ll just keep being thankful that my court case wasn’t too graphic. It was kind of rigged…but that’s a story for another day. 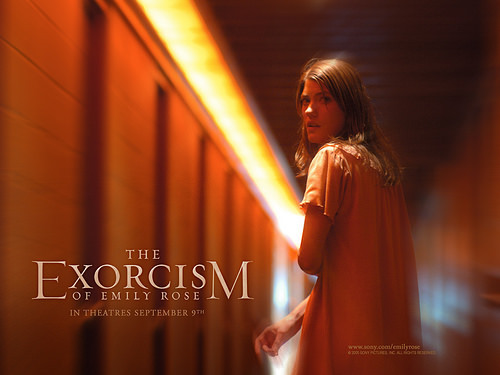 This entry was posted in Live Action Movies and tagged Based on a True Story, Court drama, Demons, Exorcism, Horror, The Exorcism of Emily Rose, Thriller by dreager1. Bookmark the permalink.